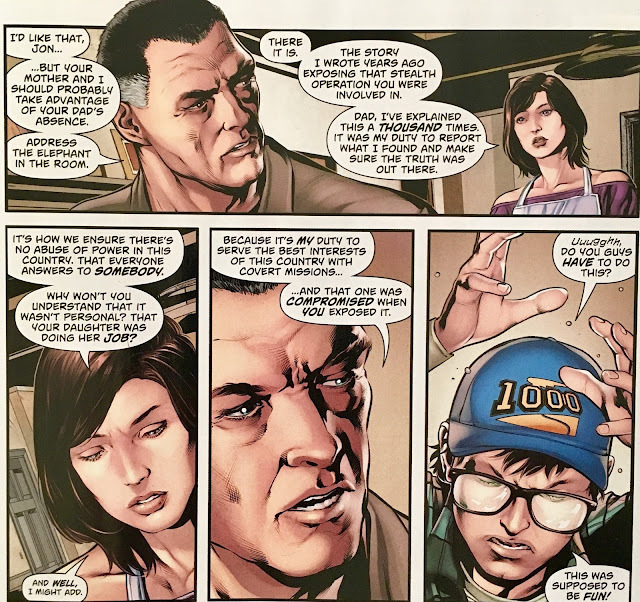 As we rapidly approach Action Comics #1000, I figured it might be a good idea to take a look at the latest... and final (barring eventual renumbering) triple-digit Action Comics issue. 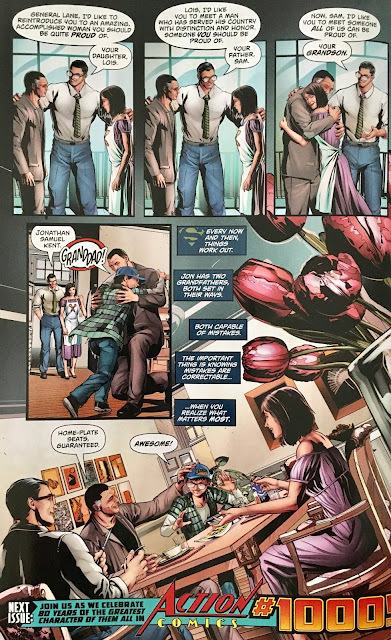 Well, come to think of it... if they ever do renumber, it's not likely it'll ever hit even 100 again... so this almost definitely is the last time we see an issue of Action Comics in the three-figures! 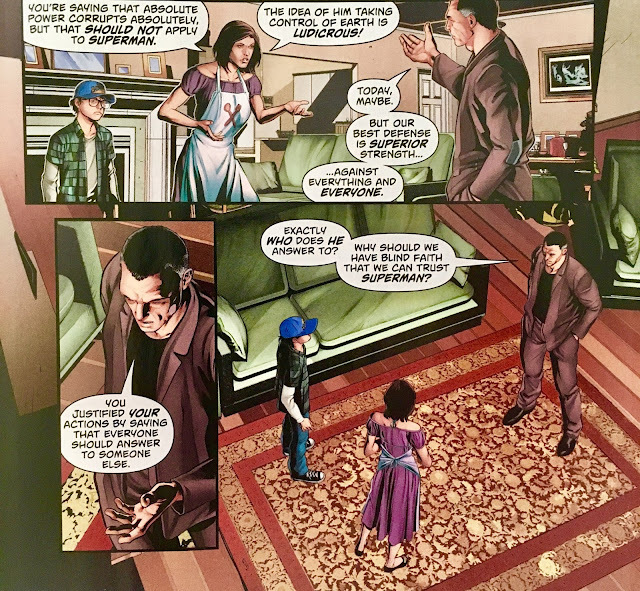 This is probably the last new issue of Action Comics we'll be looking at here at the blog for a very long time. I'm thinking I'll hold off on discussing #1000... because, if my calendar-reading is correct (heh), this humble blog will be hitting its 1,000th daily post on October 26 of this very year. If we're still a'rollin' at that point (which is questionable), I couldn't think of a better book to discuss to commemorate the event. We open with Jon Kent opening a door and inviting in... his grandfather, General Sam Lane! He enters, and immediately begins arguing with Lois. It's kinda passive-aggressive... and uncomfortable, perfectly fitting for what it is. 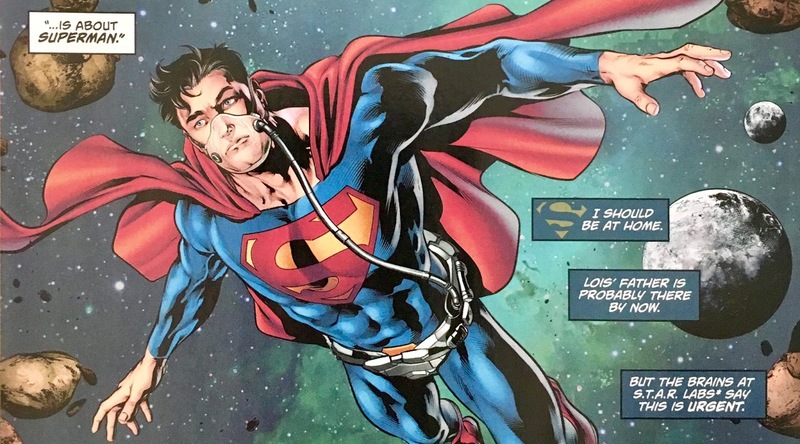 Meanwhile, Superman (using his Exile oxygen-mask) is in space. He is set to break up and divert a mile-wide asteroid that is headed straight for Earth. He does so with the quickness, though stops to admire the crystalline minerals within. Back in Metropolis, the Lanes continue to argue. Sam doesn't trust Superman... he knows Lois and Clark appear to be enamored with him (Superman, that is)... yadda yadda yadda. News comes over the wire that Superman saved the Earth from an oncoming asteroid... but that's not even enough to sway the General. He argues that while Superman is trustworthy today... that doesn't mean he will be tomorrow. For all anyone knows, Superman might just decide to take over the world someday. Valid fear, I guess. At that very moment, Superman arrives at the Fortress of Solitude. 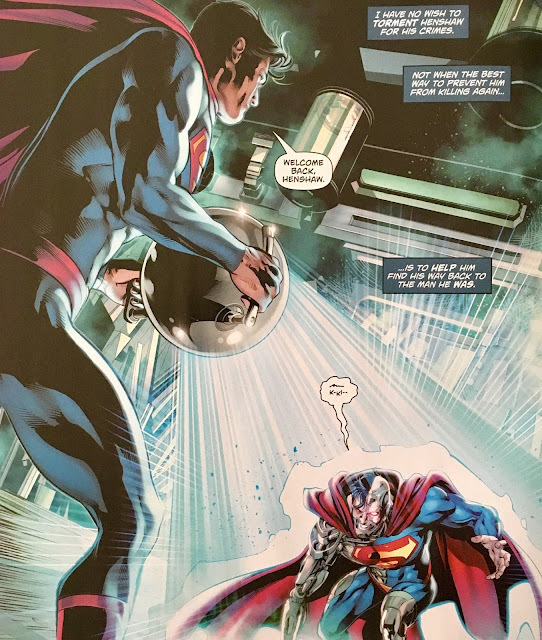 He thinks about the fate of Hank Henshaw... and appears to finally understand the inhumanity of Phantom Zone Exiling... and so, despite the Cyborg Superman's rap sheet, he is freed! Henshaw immediately attacks! 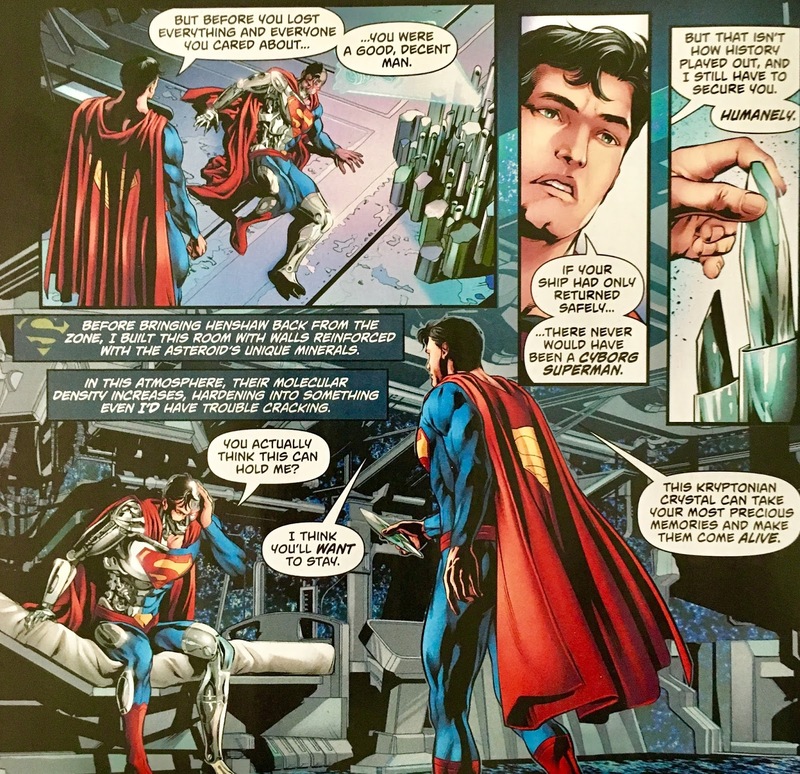 Superman tries to calm him down by explaining his plan. He is finally able to convince him that he has Henshaw's best interests at heart. 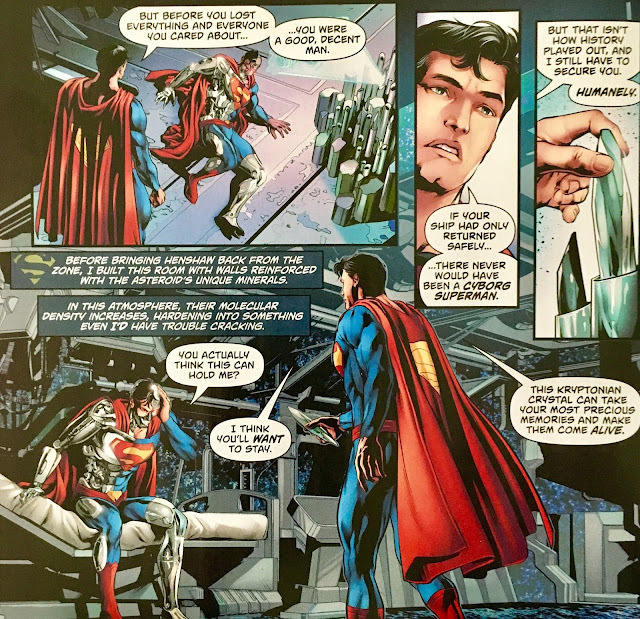 He brings him to a containment unit, and hands him a Kryptonian crystal shard with which he can relive all of the good moments in his life. It's still a prison, but far less cruel than an exile to the Phantom Zone. 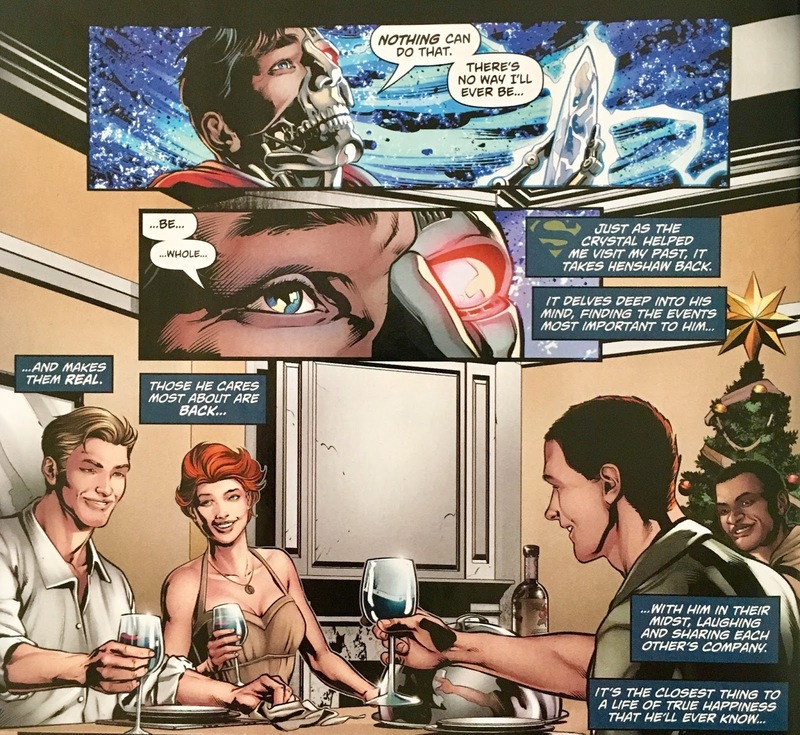 He leaves Henshaw with the crystal... and the Cyborg immediately starts reliving the "good times". We wrap up back at the Kent apartment. Clark returns just as Sam Lane is leaving... and they finally bury the hatchet... at least for now. Ya know that last cookie in the bag? Or the last spoonful of ice cream? Or maybe "final" things that people who aren't obsessed with sweets use as analogies? That's this issue for me. No matter how good it was... and it was good, it was tempered by the fact that this is... it. 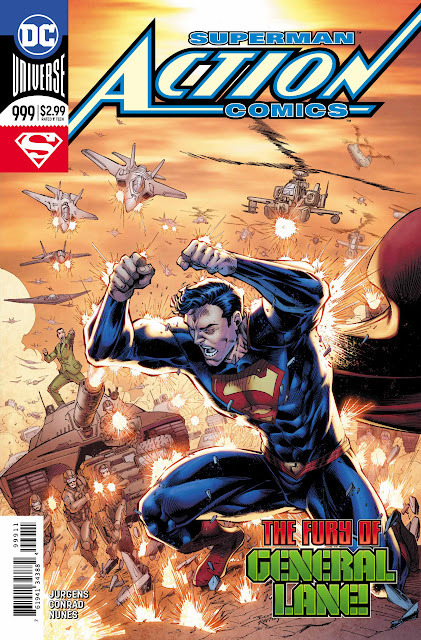 This is the last non-Bendis issue of a Superman comic for the foreseeable future. This is also the last Superman comic without the "Bendis tax"... If I were a betting man (and judging from the The Man of Steel solicits) I'd guess the Superman books will be up to (at least) $3.99. Funny, we've got creators like Scott Snyder who publicly celebrate when DC lowers the price on his book a buck... and then, there's Bendis. This trepidation is being brought to you by an actual Bendis fan. I discovered him back on Sam and Twitch... loved Powers, thought he was born to write Ultimate Spider-Man... and even defended his Avengers run when everyone else seemed to have grown tired of it. When he started messing with the X-Men... well, that's a story for another time. It took me a very long time to finally ween myself off from Marvel... despite having stopped reading their stuff, it just felt wrong for me not to buy it. When I finally lowered the ax, one of my consolations was "No more Bendis" (among other Marvel-onlys, of course). I'm a bit unsure about what's to come. Can't say that I'm all that excited... I mean, how many damn times do we need to read another take on Superman's origin? Didn't we just do that? As dangerous as wild speculation can be, I'm really unsure about how he'll handle Lois. Seems that instead of writing "strong women" Bendis falls into the trap of writing "snarkbots". While Lois has always had an edge... I'd really hate for her to become Bendis-Snarkbot Number Whatever. Anyhoo... enough about my wild (and unfounded) speculation. 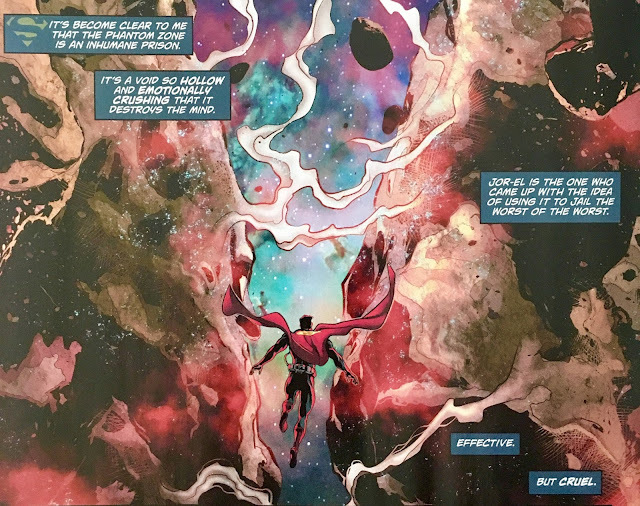 For all I know, this might be the best few years of Superman we've seen in a long time. Fingers crossed, I guess! I'll be there either way. Now, this issue... kinda feels lost in the shuffle, don't it? Doesn't really feel like a capstone for the Jurgens run. It ties up the Cyborg Superman... kinda. It reintroduces General Lane... and he and Clark sorta-kinda bury the hatchet. I dunno. While I enjoyed it, it did feel a bit "lame duck", just buying some time for #1000. I mean, the quiet-ish Sam Lane-centric story bits might've made a good back-up for #1000. I'm also not entirely convinced it's going to "stick". It wouldn't surprise me one bit if a year down the line, Sam Lane is back at it... hating Superman, and estranged from his daughter and her family. More wild speculation... but, I dunno... feels like we've ridden this ride before, ya know? His arguments on whether or not folks can trust Superman? It's all well-trodden soundbites at this point. Sure, Superman could become corrupted... he might one day decide it's "his way or the highway". Valid fears, sure... but doesn't really bring anything new to the table. You get the impression that this is the same argument that Lois and Sam have over and over again. While that feels "real", it isn't necessarily something we need to keep seeing. Perhaps, as a long-time reader/fan, I'm looking at this in the wrong context. This might be brand-new information for a new(er) reader. The Cyborg being "rescued" from the Phantom Zone was pretty neat, as was the acknowledgement that the Phantom Zone is, indeed, a fate worse than death. Surprised it took this long, but better late than never! Feels like a revelation that should be followed up on further... but I'm not holding my breath. Maybe this is the start of Superman turning a wing of the Fortress into a human Super-Prison of sorts. That could be interesting... especially the more full it gets... and when it finally gets to the point where everyone within breaks out! Ya see... I'm coming to the conclusion that it might've been a bad idea to look at this one. I'm really having a hard time separating the issue itself from my feelings on the "great unknown" before us. Maybe I'd be more optimistic if we haven't been burned (or Byrned) so many times before. I guess I'll leave it with... this was a good issue. In a vacuum, a really good issue. Worth picking up. I agree with you, this issue was very good, if you look at it on its own, and don't think about what's coming down the pike. I'm so glad you reviewed this issue because I was dying to see what you thought about Superman's realization about the phantom zone. Bringing Hank Henshaw out of the Phantom Zone definitely feels like a set up, and I guess it could be a good one. Action Comics and Superman have been two of my favorite rebirth books. I'm going to miss Tomasi on Superman a lot. Bendis might be great and I'll have an open mind, but it's going to be hard for him to top the last year and a half of Superman books for me. Haha, it's crazy that it took this long for Superman to realize that mayyyyybe the Phantom Zone isn't the best place to send the baddies! I'm hoping Henshaw's return is part of a set-up... which really makes me feel like Jurgens was doing his successor a "solid". I can't shake the feeling that this General Lane pow-wow was supposed to be a "short feature" in Action #1000. If we remove the Henshaw bits... that lends a bit more to that. Though, I might just be looking for smoke where there is none... wouldn't be the first time! Action and Superman are definitely at the top of my Rebirth list... they're the only ones (outside of Teen Titans, which I review for Weird Science) that I've kept up with. They're the only ones I actually make sure to keep up with. 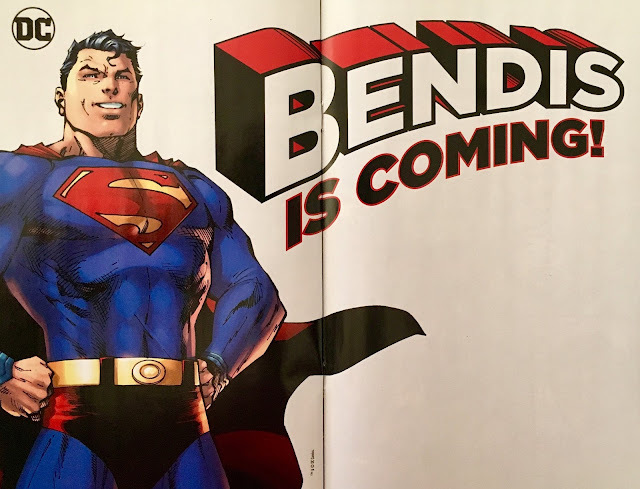 I'm nervous about what's to come... but hopeful that Bendis doesn't try and reinvent the wheel here.